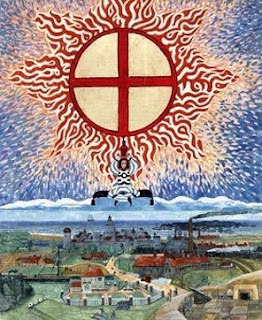 The Red Book was written during a period of Jung’s “self-experiment” from 1913 to 1930 (from age 38 to 55). This was his “metanoia”; his new focus on mythology, folklore and religion, during a period where there was a cultural shift and broad interest in comparative religion. It is written in a formal, highly stylized, religious script and contains many paintings by Jung depicting his dreams and visions. There are many religious references and biblical quotations. While the meaning of the words is timeless, the style and tone is of an earlier time. In the first part of the book is a color copy of the original in German. The second part contains commentary on Jung’s life and the English translation. Jung puts forward his personal spiritual journey to reclaim his soul by looking deeply within himself and developing a new view on both theology and psychology. In his words, he had been “living in an insane asylum of my own making”. In viewing his paintings, we see at first, someone who is terribly troubled, maybe even tortured by his past. I would suggest he is bravely facing and interpreting his own personal demons in order to find inner truth and peace. Jung had been walking down a street to see the sun shine off the new roof of a cathedral. At that moment he had a “terrible sinful thought” which he tried to ignore. He agonized for several days, until finally convincing himself that it was God himself who wanted him to think this thought much like the biblical example of Adam and Eve and the apple. Some of my friends have suggested I should peel back the curtain on my own experience. So here goes. Everyday moment, I live in a peace that passes all understanding. It is a world without words. It is a world of beauty and joy, acceptance and surrender. It is not a passive world, but is without judgment or very much thinking at all. In order to write these words, I must step back into the skin of who I used to be. I am only in the beginning of my review of the Red Book, so I don’t yet have a complete perspective. But this is what I see so far. I see an extraordinary man who had the courage to face his demons, because somewhere down deep, he knew that this was not who he really was. He knew that he was a victim of the socialization and indoctrination of his time. And, now on to today’s nature topic - the birds of prey. These majestic birds are a constant reminder that life lives off of life. Each of them have informed me and made my life fuller. I salute each of them and show my deep respect with this small recognition. 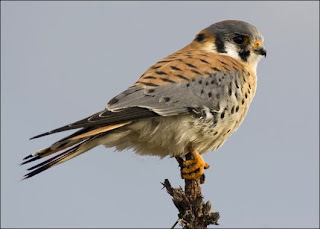 I first heard about the Kestrel when I started building bird houses a few years ago. The plans for my screech owl box also accommodate the American Kestrel. I saw my first one several months later. It is a very colorful bird in a very compact package, 9-12”. As soon as I saw him, I knew what he was; it was only later that I looked him up in my Audubon book and confirmed the sighting. I now see them several times a summer. On my place they stay to the lower, wooded creek areas. A hunter of small birds and mammals, these diminutive hawks fly low along the ground, unlike their soaring, larger cousin, the red-tailed hawk. The kestrel stands proudly erect on a point of observation waiting patiently for the scene to unfold. It will then fly low; darting left and right until it secures its prey in its talons, returning to its stand to devour its prey. It’s hard to believe that it took me 50 years to see my first one, while they have been near me all along.